In this post (a continuation from my previous post) I share the comments from three CQA-certified judges on my Improv Untitled quilt. This wallhanging recently hung in the Canadian National Juried Show in Toronto in the Abstract Art category. I could have easily entered it into the Modern category along with Round Peg, Square Hole, but I thought my chances with the jury might improve if I tried two different categories. I am happy to share these comments/critiques with you as a point of interest. I find them thoughtful, constructive and useful! The variety and scale of the shapes add visual interest. The shapes shift between being positive shapes to being negative shapes. This is visually unsettling (oh dear). Was this the mood you were intending to portray? Grid quilting pattern is effective. This well-constructed quilt works with the viewer's mind (thank you, exactly!) as the eye moves around searching for familiar and identifiable images. The bold border plays a secondary role - perhaps it could be slightly integrated into the central area. Take care when piecing dark against light and watch out for shadowing (curses, I tried my best). Negative space might be emphasized with more or different quilting (hmmm, this is a good suggestion worth considering for the next one). The design draws me in to follow pathways like a game (mission accomplished!). 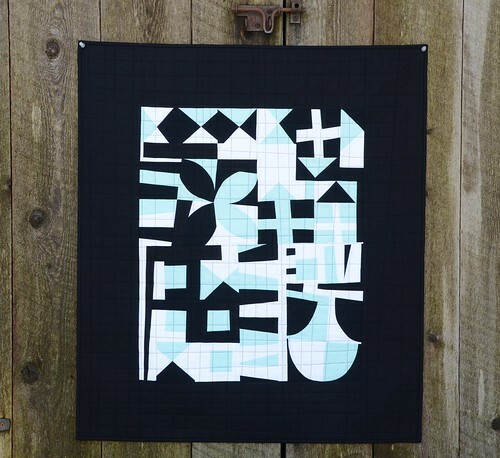 The light-coloured motif floats off the black and is anchored by the black grid quilting lines. I'd really like to thank the judges (in no particular order, because the comments are not directly attributed to any judge), Margie Davidson, Hilary Rice and Judy Villett. I am actually rather delighted with all of your thoughtful words and will take them into consideration for future work. For the first time (in 6 juried show experiences) I actually feel like I got some great value out of my entry fee with this feedback. Would you like to learn 7 improv piecing techniques and make your own quilt similar to this one in a fast-paced, fun and supportive environment? I teach this unique Speed Date with Improv workshop (as a 1- or 2-day class) and would be happy to visit your guild or shop. Email address at the top left sidebar for enquiries. I have some availability in late fall and am now booking into 2018. Sadly, due to working visa restrictions, I cannot teach in the US, but all other international and Canadian travel is welcome. Thanks for sharing these two reviews of the judging of your pieces. Judy came and spoke about what is involved in the judging and I was amazed at how little time they actually spend with each quilt. All the best with your next judging endeavour. I love this quilt. It has more interest to me because of the positive negative shapes. It means I can spend more time looking at it and concentrating on which shape my eyes focus on. It is so hard to be a judge I imagine. Their own personal style and experiences quilting must influence how they see things along with the amount of time they get to write something. Art is so hard to judge as there are so many styles and ways to do things today. Exciting times for quilt artists! Krista, thanks for sharing the judges' comments and your reactions to their comments. I also found the comments this year from the Quilt Canada judges to be thoughtful, positive and encourGing. Very thoughtful comments and I really appreciate that!